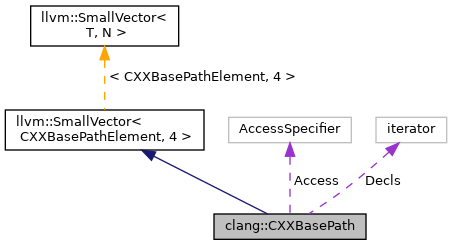 Represents a path from a specific derived class (which is not represented as part of the path) to a particular (direct or indirect) base class subobject. 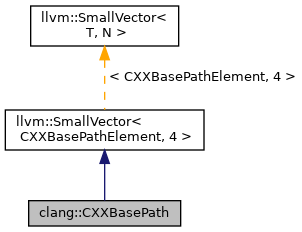 Individual elements in the path are described by the CXXBasePathElement structure, which captures both the link from a derived class to one of its direct bases and identification describing which base class subobject is being used. Definition at line 70 of file CXXInheritance.h. Definition at line 83 of file CXXInheritance.h. This is only calculated when recording paths. AS_none is a special value used to indicate a path which permits no legal access. Definition at line 75 of file CXXInheritance.h. Definition at line 81 of file CXXInheritance.h. Referenced by clang::Sema::DiagnoseAmbiguousLookup(), clang::CXXRecordDecl::FindNestedNameSpecifierMember(), clang::CXXRecordDecl::FindOMPMapperMember(), clang::CXXRecordDecl::FindOMPReductionMember(), findOrdinaryMember(), clang::CXXRecordDecl::FindTagMember(), and LookupAnyMember().